A stable precision turbo fan keeps suction airflow to the utmost degree..
Anti-spark filter is built in the dust collector to prevent dust from sticking to the filter. Shaking motor is attached so that you can shake off dust with just a single click of a button. With no protrusive part, it looks fine externally and does not occupy much space. 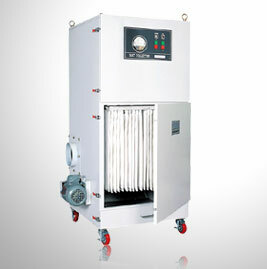 You can use aluminum-alloy fan according to your needs. We have less expensive models such as manual handle-shaking types, as well as motor-shaking types. Specification may change for product improvement without any notice. activated carbon, epoxy, corn starch, organic solvent.